Most people know surprisingly little about my family’s homeland, and even less about our food. And for good reason: Strewn some 1,000 miles off the coast of Portugal, the Azores — São Miguel, Faial, São Jorge and six other islands — are happily marooned in the middle of the Atlantic. Unfortunately, so too is our distinctive cuisine. But geographic isolation is only one conspirator in our food’s invisibility. Like most peasant cuisines, Azorean cooking is home-based; economics prevent most families from frequenting restaurants. Mine was so poor that açordas — brothy soups filled with swollen chunks of crusty homemade bread — were sometimes all there was to fill bellies. 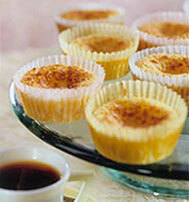 Consequently, owning a café or pastelarias (pastry shop) held little promise. So when Azoreans arrived in the United States during the great waves of immigration in the early part of the 20th century, few opened eating establishments. In turn, our food remained largely undiscovered by Americans. Those mothers and grandmothers who wanted to formally share their recipes were thwarted by illiteracy, because in the old country most of them weren’t required to attend school. Without any permanent records, many family favorites disappeared from the table when the cooks passed away. Despite such obstacles, Azorean food has managed to thrive — and even resist being overtaken by the Mediterranean-infused cuisine of mainland Portugal. For tiny islands, the archipelago’s foods are remarkably regionalized, differing by island, town and evenvizinhança, or neighborhood. According to Deolinda Avila, Palo Alto author of the self-published book “Foods of the Azores Islands,” São Miguel and some towns on Pico lead the way in the use of hot peppers. Manuel Azevedo, a São Jorge native who owns LaSalette Restaurant in Sonoma, says, “Polvo [octopus] wasn’t as popular in my family or on my island as it was in other places. We liked lamprey and limpets more.” To further compound our rich gastronomic diversity, some islands embrace spices such as cumin, allspice and cloves while others dismiss them entirely. Nowhere is Azorean individuality seen more than in sopa de couves, the islands’ version of Portugal’s unofficial national dish, caldo verde. 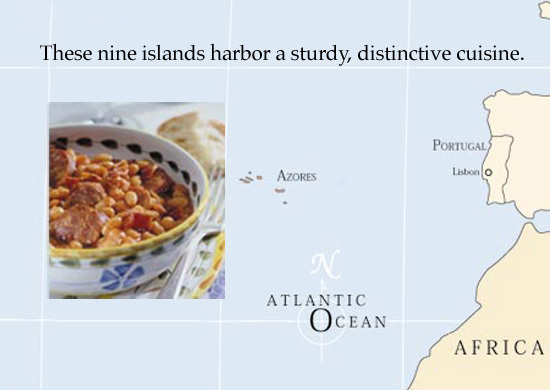 “Sopa de couves is made differently in the Azores than on the mainland,” explains Avila. “On Faial we use more potatoes and don’t mash them [to make a thickened base]. We also don’t cut the greens into thin strips. It’s a more country dish the way we make it.” Variations include the addition of red beans, ham hocks or beef shanks and a sizable portion of chouriço— not the miserly single slice of the mainland version. Azoreans can’t even agree on what key ingredient makes the best sopa de couves. Faial cooks prefer collard greens because they like the tender texture. But don’t dare tell that to cooks from São Miguel; to them, only the ruggedness of kale will do. Yet wherever they live in the islands, cooks concede one point: bacalhau (salt cod) and porco (pork) are essential. Salt cod plays such an important role in the lives of all Portuguese that it’s said we have 365 recipes forbacalhau — one for each day of the year. Pork, on the other hand, may seem like an unusual staple on sleepy volcanic islands sequestered away at sea. But to most Azoreans, cattle was more desirable for its dairy production than for its beef. Milk and cheese, which are made into a myriad of delicacies, have served as an unending source of food and income. So pork, quite literally the other meat, rose to preeminence. Pork is so highly prized that every year around Christmas families revel in a two- to three-day celebration called a matança de porco. On the first day, the fattest pig is slaughtered and cleaned, then hung from the ceiling of the home for viewing. That night, friends and family come to see it as what Avila calls “proof of [the family’s] accomplishments.” A simple yet plentiful spread of food and drink is accompanied by joyous singing and dancing. The following days are devoted to butchering the pig to make the famous linguiça and chouriçosausages, and to prepare cuts for winter meals. As Azorean frugality prescribes, no part of the pig is wasted. 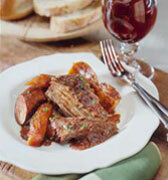 Even the organ meats are pressed into service in stews, cozidos (boiled dinner) and soups. Cod and pork may be characteristic of our cuisine, but what really defines it are the desserts — eggy and toothachingly sweet. The Moors contributed this taste for rich, sweet, eggy desserts and we quickly found inventive ways with the whole egg, the white as well as the yolk. While the Moors may have introduced egg sweets, the addiction to these treats can be blamed squarely on the islands’ nuns. To earn money for their convents, the holy sisters of the 17th and 18th centuries spent their days behind cloistered walls perfecting such whimsically christened delights as olhos de sogra (mother-in-law’s eyes), suspiros (sighs) and barrigas de freiras (nuns’ bellies). In the end, every cuisine is a product of its physical and cultural environment. Part volcanic soil and salt air, part peasant ingenuity and thrift, the hearty fare of the Azores doesn’t dazzle, but instead comforts. Some cooks believe it helps assuage the powerful saudade, or longing to belong, every Portuguese person is said to feel — regardless of which secluded, beautiful corner of Atlantis he lives on.